Phillip Fechter as President Theodore Roosevelt. 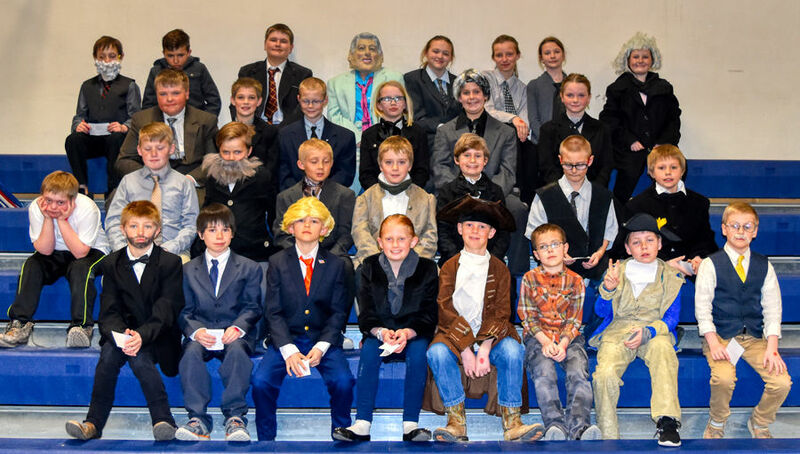 On March 21st at the Augusta school gym, students and the community had the opportunity to hear from some of America’s Presidents. Even the current President, Donald Trump. Also on hand were Bill Clinton, George W. Bush, George H.W. Bush and Jimmy Carter. They shared the room with some long-gone presidents such as George Washington and Abraham Lincoln. The event was the school’s Wax Museum. Each year, a subject is chosen and the students choose people related to the subject and portray that person. The students dress as their subject would and put together a display with photos and facts for their subject. They even put a button on their hand that is pressed by visitors as they tour the museum. Next they sit by their display waiting for someone to push the button. That’s when the wax museum comes to life. The "President" then rises and speaks briefly in the first person, saying when they were born and what their accomplishments were. Thirty students participated along with the kindergarten through first grade classes who had an earlier session on Abraham Lincoln. Parents, friends and the Augusta community came out in support. It was impressive to see how the other students, especially the high school, supported these elementary and junior-high students. The older students, some alone; some in small groups, wandered the room listening to each presentation. One high school student noticed that Donald Trump’s tie was a little loose and brought it to his attention. And, when they thought no one was looking, one kid would occasionally run over and press the button on another student, then run back to their spot and try to stifle a giggle. It was a fun day, and it is reassuring to see these youngsters take an interest in history. John Adams – Xavier June; John Quincy Adams – Royce Levine; George H. W. Bush – Zoe Elder; George W. Bush – Corbin Thompson; James E. Carter – MacKenzie Steiner; William Clinton – Kadee Carlbom; Calvin Coolidge – Conor Barrett. Gerald Ford – Ryan Arps; Dwight D. Eisenhower – Austin Mosher; James Garfield – Troy Barrett; Ulysses S. Grant – Jesse Gebhardt; William Harrison – Aidan Harris; Rutherford B. Hayes – Camden Wallace; Herbert Hoover – Nina Smock. After the Wax Museum, the Augusta American Legion Auxiliary presented their Americanism program, recognizing students who had submitted essays. This year’s subject concerned the problem of homeless veterans. The first-place winners read their essays to the students and members of the community gathered in the gym.